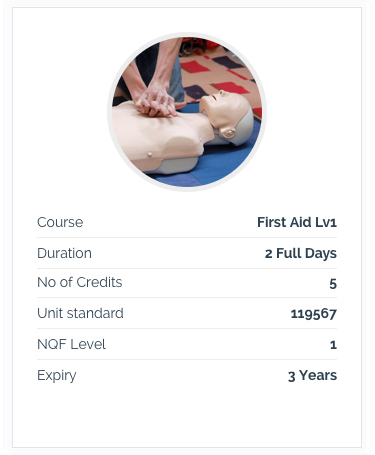 Impact of Accreditation on First Aid Training Providers For over two decades employers needed to appoint workplace First-Aiders. The old Machinery and Occupational Safety Act originally made provision in General Safety Regulations (3) [GSR] for Department of Labour [DoL] “approved” First Aid Trainers. GSR is still in existence under the Occupational Health & Safety Act and is as relevant now, as it was then. GSR (3) opened the door to a generation of First-Aid training providers, who through a simple DoL “approval” system were able to serve employers and employees by delivering legal compliance and relevant short life-skills courses. Albeit it imperfect, the GSR system with its coveted CI No [Chief inspector’s No], was efficient and effective with hundreds of thousands, if not millions of citizens receiving basic First Aid training in South Africa. 1. Facilitated the selected Level 1, 2 or 3 courses. 2. Learners were tested for acquired knowledge and skills and retrained if necessary. 3. Issued a DoL “Certificate of Competency” to the Employer or Learner. On 30 September 2016, providers awoke to a notice published by the CI under Notice 1198 which read; “Applications will only be considered if accompanied by a valid accreditation certificate issued by the Health and Welfare SETA”. The following disturbing paragraph stated; “Those already registered with the Department of Labour, will after the promulgation of this notice, be granted 12 months to be accredited with HWSETA. All service providers who fail to register within the given period will be automatically de-registered from the Department of Labour database and will no longer be recognized as legitimate service providers”. appalling potential effects on active role-players. The absence of a First Aid Professional Body or Institute meant there was no one to speak for the providers. After some push-back, the Chief Inspector amended the Notice offering an option to apply to the LGSETA, MERSETA, TETA, SASSETA and FOODBEV for accreditation. This meant that service providers were thrust into the bewildering world of SAQA, SETA and NQF. New terminology, methodology, pedagogy and chronology. As the 30 September 2017 deadline loomed, an amended CI Notice was published on 11 August 2017 which stated; “Applications will only be considered if it is accompanied by a valid accreditation certificate issued by the QCTO”. QCTO This new four-letter acronym was followed by the requisite for all SETA / QCTO [Quality Council for Trades and Occupations] accredited organisations to register with DHET [Department of Higher Education]. 2 or 3-day “Short-Courses” were morphing into “skills programmes” and “qualifications” more suited for colleges and universities.